Edwin Giles Hawkins was born on 11 November 1877 at Yeovil, the son of Giles Hawkins (1848-1919) and Elizabeth née Baulch (1849-1935). By 1875, when he was 26 years old, Giles Hawkins, born in West Coker, was licensee of the Anchor Inn in Vicarage Street with his wife Elizabeth. In the 1881 census Giles and Elizabeth were living in the Anchor Inn with their two sons; 3-year old Edwin and 1-year old Arthur. By 1891 Giles, Elizabeth and their family were living next door to the Anchor Inn at 8 Vicarage Street. Giles was listed as a leather dresser and by now there were five children; Edwin aged 13, William A (presumably Arthur of the earlier census) aged 11, Mabel aged 8, Roland age 5 and 6-month old Leonard. By the time of the 1911 census Giles and Elizabeth, both now aged 62, were living at 22 Vincent Street with their three unmarried sons Edwin, Arthur and Leonard, aged 33, 31 and 20 respectively. Edwin gave his occupation as an unemployed general labourer. It is not known when Edwin enlisted, although it is known that he enlisted at Yeovil and it was probably in 1914 since by then he was aged 37 - the upper limit for men accepted into the army. He was Private Edwin Hawkins (Service No 3/7443) of 1st Battalion, Somerset Light Infantry. The prefix '3' of his service number suggests that he was initially enrolled into the 3rd (Territorial) Battalion, but later transferred to the 1st (Regular) Battalion. At the outbreak of war in 1914 the 1st Battalion was in Colchester, with 11th Brigade, 4th Division. The Battalion landed at Le Havre, France with the British Expeditionary Force (BEF) on 22 August 1914. It is likely that Edwin would have joined his Battalion after his basic training, probably around the end of 1914. 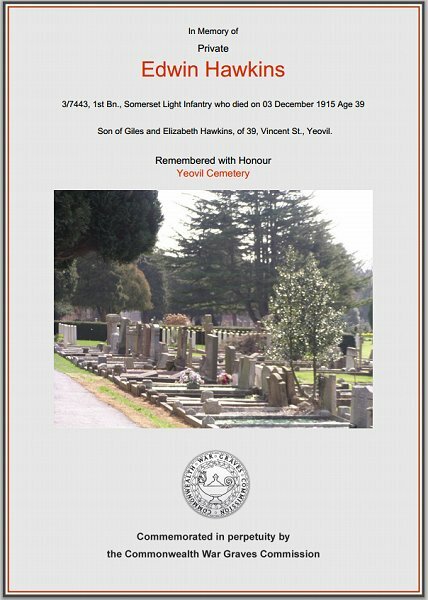 Edwin Hawkins died in Yeovil on 3 December 1915. It is not really known if he died from wounds received at the Front, whether or not he was gassed, or died from other causes while in Yeovil. He was interred in Yeovil Cemetery, Grave B.3091 and his name is recorded on the War Memorial in the Borough. The Commonwealth War Graves Commission certificate in memory of Edwin Hawkins.